It might be nicknamed La Serenissima (the most serene) but there’s little that could be described as calm about Venice. Home to some of the most iconic architecture on the planet, its ancient colonnades and meandering canals are very much part of a truly modern city. 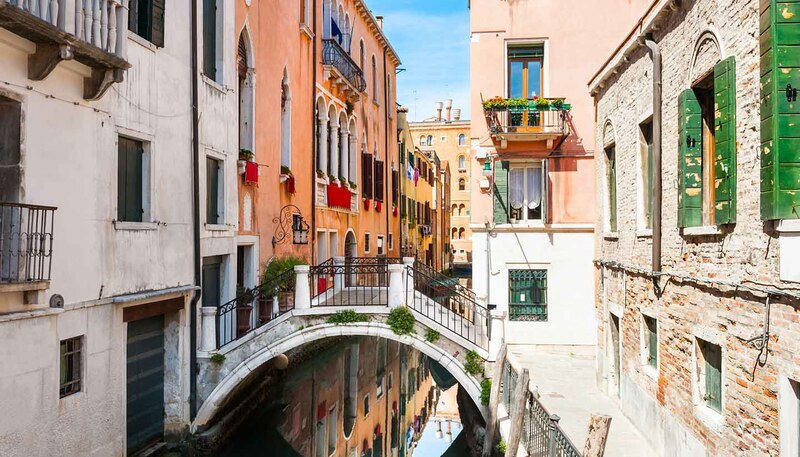 Built across 116 islands set in a formerly blue lagoon (now verging on brown), Venice benefits from a fascinatingly colourful past with scores of spectacular buildings and a sprinkling of stardust. The birthplace of Tintoretto and Titian has no shortage of artistic and cultural treats either, although the inspiration for many of their works - the city itself - is just as compelling. Despite its reputation for canals, Venice is a never-ending maze of tiny cobbled courtyards and winding back streets, linked by arched bridges and dotted with osterie (simple bars serving food and drink), traditional trattorias and frequently tacky souvenir shops. But its real beauty lies in its unique waterways and striking bridges, such as the iconic Rialto. Away from the canals, the city is dominated by the Saint Mark's Basilica and for good reason: it’s truly one of the most impressive pieces of Renaissance architecture on the planet and its byzantine golden horses are nothing short of spectacular. Castello, the surrounding area, is just as magnificent with some eye-wateringly expensive palazzo hotels. San Polo, with its beautiful Santa Maria dei Frari church, is also worth making time for, not least because it is also home to the Scuola di San Rocco, noted for its collection of Tintoretto paintings. Quiet Santa Croce and arty Dorsoduro are not to be missed either, while Campo Santa Margherita is the place to go for late nights and interesting locals. You might be amid ancient buildings, but in bustling modern Venice, serenity is the last thing you’ll find.